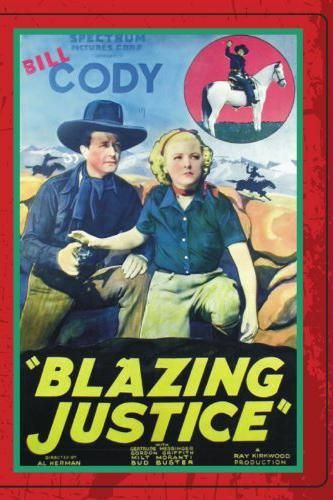 The penultimate Bill Cody Western in a series of nine produced by Gower Gulch company Spectrum Pictures, Blazing Justice featured its weatherbeaten star as a lawman mistaken for an outlaw by pretty Gertrude Messinger. Naturally, the real culprit is the very man Cody was trailing in the first place. Whew the girl's father (Budd Buster) is found murdered, Cody becomes an obvious suspect but a $10,000 insurance settlement eventually lures the real killer (Gordon Griffith) into a trap. A holdover from the silent era, Cody cut a rather dismal figure at this point in his career and was beaten not once but twice by villain Griffith in Blazing Justice. Producer Ray Kirkwood announced in late 1935 that Cody would nevertheless star in a second series for Spectrum, but following Outlaws of the Range (1936) the veteran performer found himself replaced with crooner Fred Scott.